Job Path 40th Anniversary Gala: Thanks to everyone who supported us! Job Path is truly grateful for the support and generosity of our donors and partners. 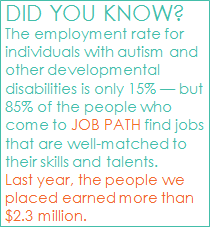 Each one of you helped us make our mission to improve the lives of people with developmental disabilities a reality. Special thanks to Tina Brown and Sir Harold Evans, and Danny Meyer, CEO and Founder of Union Square Hospitality Group.